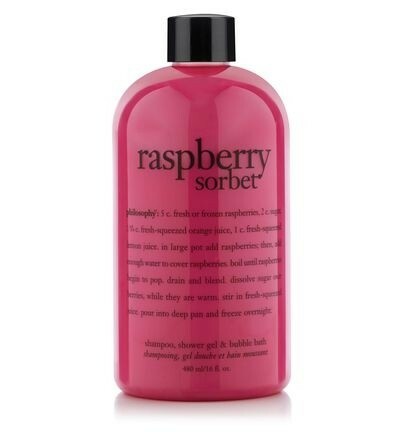 the luscious raspberry sorbet scent is positively refreshing. feel and smell good all over with our shampoo, shower gel & bubble bath. water (aqua), tea-lauryl sulfate, ppg-2 hydroxyethyl cocamide, cocamidopropyl betaine, glycol stearate, glycerin, fragrance (parfum), peg-150 distearate, tocopheryl acetate, polyquaternium-7, glyceryl acrylate/acrylic acid copolymer, propylene glycol, sodium benzotriazolyl butylphenol sulfonate, buteth-3, tributyl citrate, sodium chloride, citric acid, methylchloroisothiazolinone, methylisothiazolinone, red 33 (ci 17200), yellow 5 (ci 19140). 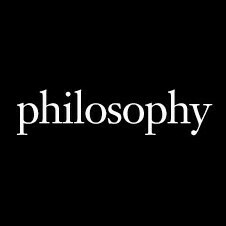 The distinctive Philosophy bottle. A lovely sweet, refreshing fruity scent. A very thick gel, so a little goes a long way. Creates a lovely soapy lather on the skin. Good cleansing power. Not a distinctive raspberry scent. Doesn't create a foam when used as a bubble bath. Difficult to use as a shampoo - really needs to be worked through the hair. A wonderfully fruity 3-in-1 gel that's best used as a shower gel. Thuis showergel/bubble bath smells really really nice,sweet but also really fruity. I must admit the colour and name of this really caught my eye and as i am a sucker for great smelling products ionce i smelt this i was hooked. I love the fact that it has multi uses although i did use mainly for the shower. You only need a small amount to produce masses of bubbles so it will last for ages. It cleanses the body and hair brilliantly and a little product lathers beautifully on a sponge or body puff. In the bath, sadly it does not give plentiful bubbles but the fragrance is wonderful. After use your skin feels beautifully soft and moisturised and is left delicately scented from the perfume although this quickly dissipates so that it does not clash with your fragrances. Your skin also feels invigorated and this is a lovely ‘pick me up’ product in the summer. I have suffered no skin irritation from this product at any point. I prefer not to use this as a hair wash as it is not hydrating enough for my hair but for those that prefer to use a 3-in-1 bathing product this is perfect.